It has been suggested that Baskin-Robbins Australia be merged into this article. (Discuss) Proposed since September 2018. Baskin-Robbins is an American chain of ice cream and cake specialty shop restaurants. Based in Canton, Massachusetts, it was founded in 1945 by Burt Baskin and Irv Robbins in Glendale, California. It claims to be the world's largest chain of ice cream specialty stores, with 7,500 locations, including nearly 2,500 shops in the United States and over 5,000 in other countries as of December 28, 2013. Baskin-Robbins sells ice cream in nearly 50 countries. The company is known for its "31 flavors" slogan, with the idea that a customer could have a different flavor every day of any month. The slogan came from the Carson-Roberts advertising agency (which later merged into Ogilvy & Mather) in 1953. Baskin and Robbins believed that people should be able to sample flavors until they found one they wanted to buy. The company has introduced more than 1,000 flavors since 1945. The company has been headquartered in Canton, Massachusetts since 2004 after moving from Randolph, Massachusetts. By 1948, Burt and Irv had opened six stores. The first franchise covering the sale of ice cream was executed May 20, 1948, for the store at 1130 South Adams in Glendale (Store #1). In 1949, the company's production facility opened in Burbank. Burt and Irv made the decision to sell the stores to the managers. In 1953, Baskin-Robbins hired Carson-Roberts Advertising who recommended adoption of the number 31 as well as the pink (cherry) and brown (chocolate) polka dots and typeface that were reminiscent of the circus. The first store that adopted the new 31 look was 804 North Glendale Ave. in Glendale, California in March 1953. Between 1949 and 1962, the corporate firm was Huntington Ice Cream Company. The name succeeded The Baskin-Robbins Partnership and was eventually changed back to Baskin-Robbins, Inc. on November 26, 1962. 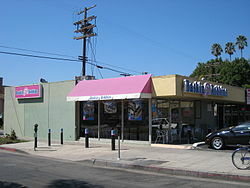 Baskin-Robbins was owned by its founders until it was acquired in 1967 (just prior to Burt Baskin's death) by the United Brands Company (United Fruit). In the 1970s, the chain went international, opening stores in Japan, Saudi Arabia, South Korea, and Australia. Baskin-Robbins also was the first to introduce ice cream cakes to the public. In 1972, the company went public for the first time in its history when United Brands sold 17% in an IPO. A year later, British food company J. Lyons and Co. purchased Baskin-Robbins from United Brands and all public stock. J. Lyons then merged with Allied Breweries, becoming Allied-Lyons in 1978. Allied-Lyons then merged with Pedro Domecq S.A. in 1994, becoming Allied Domecq. Baskin-Robbins and Dunkin' Donuts comprise Dunkin' Brands, Inc. Dunkin' Brands was part of Allied Domecq until its purchase in 2006 by a group of private equity firms - Bain Capital, Thomas Lee, and The Carlyle Group. In 2008, Baskin-Robbins launched its first full menu of better-for-you frozen treats called "BRight Choices" and removed all artificial trans fats from its ice cream. BRight Choices provides a variety of options for guests looking for a lighter treat. Irv Robbins died at Eisenhower Medical Center in Rancho Mirage, California on May 5, 2008, at age 90. In August 2012, Dunkin' Brands became completely independent of the private equity firms. While Baskin-Robbins struggled in the early years of the 2000s to retain business with competitors such as frozen yogurt shops, 2013 saw a turnaround in the company's fortunes, with four new U.S. stores opened. An additional five to ten shops were planned to open in 2014, however, Baskin Robbins ultimately surpassed that goal with a grand total of 17 net new openings throughout 2014, and continued growth of the brand with 15 new stores opened in 2015. Many new Baskin- Robbins shops are co-branded with Dunkin' Donuts, including California's first co-branded location of the two in San Diego, which opened in March 2014. In 2014, Baskin-Robbins also began selling its ice cream for the first time in supermarkets across the U.S.
Baskin-Robbins has more than 7,500 shop locations in nearly 50 countries outside the U.S., including locations in: Armenia, Aruba, Australia, Azerbaijan, Bahrain, Bangladesh, Belarus, Bhutan, Canada, China, Colombia, Curaçao, Denmark, Dominican Republic, Ecuador, Egypt, Honduras, India, Indonesia, Ireland, Japan, Kazakhstan, Kuwait, Latvia, Malaysia, Maldives, Mauritius, Mexico, Nepal, Oman, Pakistan, Panama, Philippines, Netherlands, Portugal, Puerto Rico, Qatar, Russia, Saudi Arabia, Singapore, South Africa, South Korea, Spain, Sri Lanka, St. Maarten, Taiwan, Thailand, Tajikistan, United Arab Emirates, United Kingdom, Uzbekistan, Vietnam and Yemen. International locations feature flavors of ice cream popular to the tastes of each country, such as Red Bean, Green Tea, Litchi Gold, Black Currant, Cantaloupe, and Coconut Grove. ^ "Dunkin' Brands - People". Dunkin' Brands. Archived from the original on January 19, 2013. Retrieved January 27, 2013. ^ a b c d "Our History Archived 2013-01-15 at the Wayback Machine." Baskin-Robbins' web site. Accessed 25 Feb. 2013. ^ "About Baskin-Robbins". Archived from the original on 2014-02-19. Retrieved 2014-02-18. ^ Staff (2013). "History: Dunkin' Brands". Dunkin' Brands. Archived from the original on 23 April 2013. Retrieved 20 March 2013. ^ a b "Baskin-Robbins' 31 original flavors Archived 2008-05-11 at the Wayback Machine." LA Times. 2013. Accessed 25 Feb. 2013. ^ "Baskin-Robbins Japan Celebrates the Opening of Its 1,000th Store". Archived from the original on 2014-02-23. Retrieved 2014-02-19. ^ This page, "Archived copy". Archived from the original on 2013-04-23. Retrieved 2013-03-20. CS1 maint: Archived copy as title (link), at the Dunkin' Brands site, confirms the Baskin-Robbins founding date, the J. Lyons purchase (and date), the Allied Breweries merger (and date), and the Pedro Domecq merger (and date). Quotes: "1946: Baskin-Robbins is founded by Burt Baskins and Irv Robbins. "; "1973: London-based J. Lyons & Co., Ltd., purchased Baskin-Robbins. "; "1978: J. Lyons is purchased by Allied Breweries, creating Allied Lyons. "; "1994: Allied Lyons partners with Pedro Domecq, the leading spirits marketer in Spain and Mexico, to form Allied Domecq." ^ "Baskin-Robbins intros BRight Choices treats". Archived from the original on 2014-02-18. ^ "Co-founder of Baskin-Robbins ice cream stores dies at 90". USA Today. AP. May 6, 2008. Archived from the original on September 4, 2012. Retrieved September 4, 2012. ^ "Dunkin' Brands". Retrieved March 20, 2017. ^ Kate Taylor (24 February 2014). "How Baskin-Robbins Is Trying Not to Disappear". Entrepreneur. Archived from the original on 2014-07-14. Retrieved 2014-07-08. ^ Dunkin' Brands Group, Inc. (12 January 2015). "Dunkin' Brands Announces 2014 Domestic Restaurant Growth". Archived from the original on 2015-04-02. Retrieved 2015-03-21. ^ "BASKIN-ROBBINS PACKAGED ICE CREAM AND ICE CREAM BARS NOW AVAILABLE IN GROCERS' FREEZERS ACROSS THE COUNTRY" (Press release). May 20, 2014. Archived from the original on 2014-07-07. Retrieved 2014-07-08. ^ "Baskin Robbins International". Archived from the original on 2017-01-29. Wikimedia Commons has media related to Baskin-Robbins.